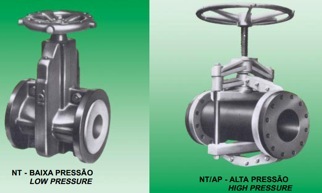 The valves NT Series are a simple and secure way to control the flow of materials in a pipe. The flux occurs with the fastening and loosing a flexible tubular diaphragm (sleeve), which is usually made of natural or synthetic rubber. 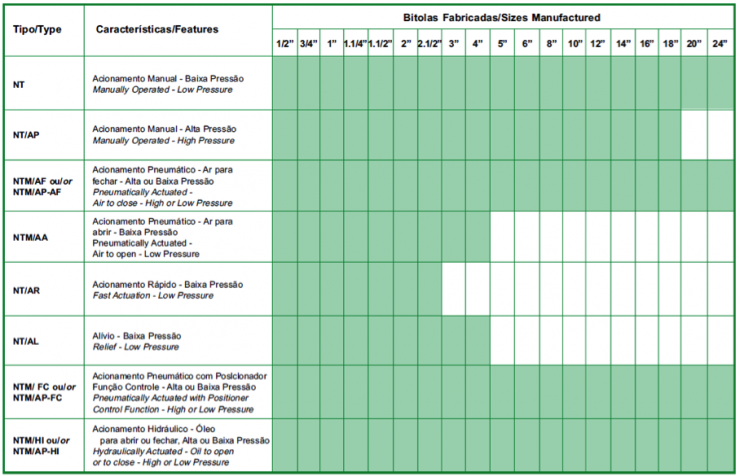 The only components exposed to the fluid is the tubular diaphragm, and as so, the longevity of the components is increased. The closure of the system will be always complete, even when parts of solid materials are caught inside the valve, due to the flexibility of the tubular diaphragm. Is remarkable that, for this reason, there will be practically no loss of charge and no accumulation of materials inside the valve, said facts being of extreme importance when the valve operates with food products, heavy suspensions, powders, minerals, etc. 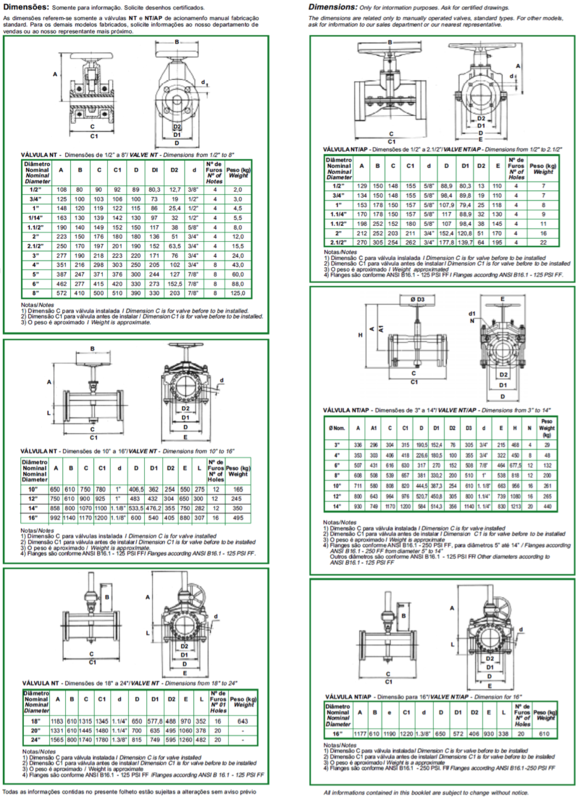 NT valves are used in the chemical industries, mining industries, paper industries, dyes, explosives, food, waste and water treatment, cement, among others. Free flow, with no obstructions. Positive closure, even over solids. 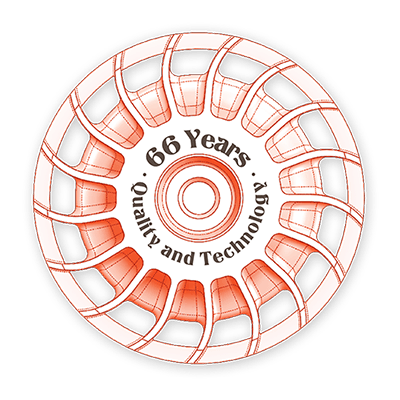 For higher temperatures, diaphragms made of special materials elastomers can be provided, on request. 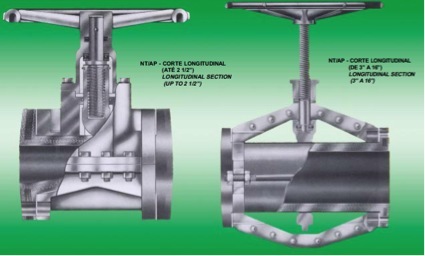 Up to the 8” size, the NT valves are supplied with a fully closed construction, with internal parts made of ductile iron, steel stem and external body in cast iron or cast aluminum (optional), valves from 10” up to 16” size are supplied with the same materials, but with open construction and, from 18 ”to 24” sizes, the same open construction, but actuated through an incorporated gear reducer. The NT/AP type valves are supplied in fully closed construction up to 2.1/2” size; from 3 ” to 16 ” size are open construction, being the 16” and up slzes actuated through incorporated gear reducer. Natural rubber: up to 24”. Hypalon* (Chloro Sulfonil Polyethylene): up to 8 ”. Neoprene* (Chloroprene): up to 8”. Other materials, subject to future consultation: Viton* (Fluoroelastomer), Buna N (Butadiene Nitrile), Butyl (Isobutylene Isoprene), EPDM (Ethylene Propylene Terpolymer) and Adiprene* (Polyurethane).